We’d love your help. Let us know what’s wrong with this preview of The Night Bookmobile by Audrey Niffenegger. To ask other readers questions about The Night Bookmobile, please sign up. Why isn't their a sequel? This was an excellent idea! "What would you sacrifice to sit in that comfy chair with perfect light for an afternoon in eternity, reading the perfect book, forever?" The Night Bookmobile is the first graphic novel of Audrey Niffenegger, who also wrote the bestseller, The Time Traveler's Wife (2003) and Her Fearful Symmetry (2009). The description "graphic novel" is possibly rather grand, as this is much more of a short story length. In fact it actually started life as a short story, which presumably allowed more opportunity "What would you sacrifice to sit in that comfy chair with perfect light for an afternoon in eternity, reading the perfect book, forever?" The Night Bookmobile is the first graphic novel of Audrey Niffenegger, who also wrote the bestseller, The Time Traveler's Wife (2003) and Her Fearful Symmetry (2009). The description "graphic novel" is possibly rather grand, as this is much more of a short story length. In fact it actually started life as a short story, which presumably allowed more opportunity for use of imaginative language and descriptions. Audrey Niffenegger then adapted her story into this piece which was serialised by "The Guardian" newspaper. The author says that is is the first installment of a larger work, to be called "The Library." The story was directly inspired by H.G. Wells's short story, "The Door in the Wall" and also has its origins in dreams which the author had in her childhood. It contains echoes of many famous dream-like fantasy stories, and in this is quite a satisfying haunting tale. The "feel" of this graphic novel is slightly surreal and off-kilter, but the Artwork unfortunately does little to enhance this effect. Niffenegger produced the whole work, but although her Artwork is competent, it does not have a "wow" factor. If on the other hand she had used her linguistic skills in a more versatile format than the fairly short bursts of a graphic novel, this story has the potential to feel quite magical. The protagonist, Alexandra Jones, a lonely and troubled young woman, only really feels comfortable in her dark fantasy world. This is the cue for her fantasy world to turn real. And, of course, to not be as freely accessible as her heart would desire, so that she constantly yearns for it. What makes this story a new one is that the fantasy world is a travelling mobile library, which only exists at night, and only to her eyes. It has an enigmatic "guardian", Mr. Openshaw, who seems to know an awful lot about her already. And the books in it? Well, there's something unique about them too. "I explored the farthest recesses of my collection. Each spine was an encapsulated memory, each book represented hours, days of pleasure, of immersion in words." This review has been hidden because it contains spoilers. To view it, click here. According to Neil Gaiman's blurb on the back, Niffenegger's "The Night Bookmobile" is "a love letter...to the things we have read, and to the readers that we are." He goes on to describe it as "a cautionary fantasia for anyone who has ever loved books." I consider this review as a cautionary tale for anyone tempted to take that description at its word. A more accurate description would be that The Night Bookmobile is a sometimes charming, sometimes creepy short story written and illustrated by th According to Neil Gaiman's blurb on the back, Niffenegger's "The Night Bookmobile" is "a love letter...to the things we have read, and to the readers that we are." He goes on to describe it as "a cautionary fantasia for anyone who has ever loved books." I consider this review as a cautionary tale for anyone tempted to take that description at its word. A more accurate description would be that The Night Bookmobile is a sometimes charming, sometimes creepy short story written and illustrated by the woman who wrote "The Time Traveler's Wife." If this were not by Audrey Niffenegger, I doubt that it would have seen publication, much less garnered even a fraction of the critical attention that it has received. The plot and the story are exceptionally brief, yet contain holes wide enough to drive a magical Winnebago through. The general idea seems to be that each reader in the world has a personalized Night Bookmobile, reading hours dusk till dawn, which contains every book we have ever read (as well as notes, signs, cereal boxes, etc). A nice idea, certainly. The main character, Alexandra, stumbles across her Night Bookmobile on the streets of Chicago one night, after a fight with her boyfriend. She becomes entranced and obsessed with finding it again, analogizing it to finding and then losing the perfect lover. She articulates her absorption and fascination with the words "I had seen myself, a portrait of myself as a reader." On her second visit, she waxes rhapsodic about "the same way that perfume captures the essence of a flower, these shelves of books were a distillation of my life." At this point, she expresses her desire to not leave the bookmobile, to stay on in the world of books that she has read over the course of her life. The librarian, Mr. Openshaw, declines her request but suggests that she could become a librarian out in the real world. She takes his suggestion, and eventually becomes a director of a branch of the Chicago Public Library system. While her character is convincingly established as a person who prefers books to people and/or social interaction, one of the main things that I don't accept about her is the way that she is presented as an avid reader who nonetheless longs to spend all of her time in a magical bookmobile that contains only books she has already read. What avid reader, what true lover of books, would willingly resign themselves to only the collection of books that they have already finished? I am very big on rereading, but no attention or thought seems given to the idea that she would have to be willing to forgo the reading any new books. Ever. At all. It would mean resigning all unexpected plot twists, all page turning suspense, all the joy of discovering a new favorite, of savoring new characters and situations. Is she an avid reader, or is she just a not-very-forward-thinking stick? And, although she frequently reminisces about reading Nancy Drew under the covers with a flashlight, or "A Distant Mirror" in a coffee shop while waiting for a blind date - she glosses right over the fact that staying in the bookmobile would cut off all these worldly experiences, including her frequent night walking rambles across the city. She would have to stay sequestered away in the crowded stacks of the Night Bookmobile reading a bunch of books that she has already read. This makes no sense. And it is not fantastical so much as it is depressing. After her third visit to the bookmobile, for no reason in particular, she seems to decide that what she needs to do to get to work in the bookmobile is to kill herself. Which she then does, and then succeeds in getting her wish, in a manner of speaking. It turns out that only living people can be readers, so her whole collection of books is decommissioned and she will now have to be the personal librarian for a kid named Sarah, who has only just learned to read "Goodnight, Moon." There is also a giant scene of heaven as a library, which seems a little strange, considering out pseudo-heroine works in a library. Is heaven just a library without patrons? But without patrons, there would be no library. Lame. Also, if (as explained by Mr. Openshaw) each Night Bookmobile has only one patron, why - in spite of her frequent searching for it - was Alexandra only able to find her Night Bookmobile once every nine years or so? What is it about the Night Bookmobile that makes it more compelling than say, your own personal bookshelves? I can see that it would be exciting to have it contain books that you'd forgotten reading, but if you forgot them, are they not - by nature - forgettable? And for all her raptures about all the books it contained - does she love every book she's ever read? Wouldn't it be kind of a drag to also see books that you hated, outdated text books, and cook books (where do you cook in the Night Bookmobile? Do they have a hot plate or something in the back?) along with all your beloved favorites? It's not like she lives in the world of Fahrenheit 451 where books have to be memorized or they could be lost - she has access to all these books all the time. It could be that I am too grudging in my ability to engage in the willful suspension of disbelief for this story. But I feel like these flaws go to the heart of the character who is supposed to be at the heart of the story. If you don't believe in her, you don't believe in the story itself. And as a careful reader, and a thinking reader, I don't. Unlike Alexandra, I did not become bewitched by the spell of the Night Bookmobile. In fact, I am actually eager to return it to the library. I definitely expected something better here. I have no idea what the author wants me to come away with here. It's like the protagonist loved rediscovering all the books, magazines, periodicals, etc. she had ever read, but then later felt she had wasted all of her time reading, and thought of everything she had "given up" for reading. I, however, didn't see that at all, since she got a career and joy out of her passion for books, and found joy in her ever-expanding library. Weird and confusing en I definitely expected something better here. I have no idea what the author wants me to come away with here. It's like the protagonist loved rediscovering all the books, magazines, periodicals, etc. she had ever read, but then later felt she had wasted all of her time reading, and thought of everything she had "given up" for reading. I, however, didn't see that at all, since she got a career and joy out of her passion for books, and found joy in her ever-expanding library. Weird and confusing ending. It made no sense to me, especially when the Librarian told her something like the dead don't read, yet he himself is always seen with a newspaper. And I don't understand how the protagonist is satisfied and smiling at the end. It was disappointing and I didn't understand what kind of message was supposed to be here. Even after reading the afterword and her acknowledgements, I had no idea what the author wanted me to get from this. I didn't see it as a "cautionary tale" about the "seductions of the written word." I saw the story of an avid reader who stumbles across a book mobile one night, is inspired to read more and become a librarian, then, for some reason, falls apart. I don't understand why she sees the book mobile now or why it appears when it does (that's never explained), and I don't see the purpose for it. Does it want to show her all the wonderful books she's read and have her expand it, or . . . what? Because no one ever tells her NOT to read. I picked this one up because it's about a library and I saw the nice blurb by Neil Gaiman on back. Unfortunately I didn't find it at all to be a story "perfectly told". The Night Bookmobile is the first of a larger work being titled The Library, as explained by the author in the "after words". Because of this I feel it's possible that my understanding of the story is in fact out of context until I read the completed book. But since it is published here as a single book, I also find it fair to re I picked this one up because it's about a library and I saw the nice blurb by Neil Gaiman on back. Unfortunately I didn't find it at all to be a story "perfectly told". The Night Bookmobile is the first of a larger work being titled The Library, as explained by the author in the "after words". Because of this I feel it's possible that my understanding of the story is in fact out of context until I read the completed book. But since it is published here as a single book, I also find it fair to review it based on itself alone. About the length of a child's picture book, the story follows a woman named Alexandra from a random night in her early adult life when she comes across a mysterious and almost magical-seeming bookmobile. She becomes obsessed with it's existence, its strange librarian Mr. Openshaw, and with finding it again when she realizes its visits are inconsistent. However the story never really makes sense. We never find out why Alexandra gives up so much of her daily life to pursue this bookmobile, or share enough time with her to fully connect. What if there were a place that housed all the books you've ever read, from the picture books of your preschool years to the pile on your nightstand right now? What if that place were a mysterious bookmobile with rock music blaring loudly from its speakers and an enigmatic driver who knows more about you than you know yourself? What if that bookmobile only came around at night, and only every few years when you least expect it? The narrator of this intriguing graphic novel, Alexandra, becomes ob What if there were a place that housed all the books you've ever read, from the picture books of your preschool years to the pile on your nightstand right now? What if that place were a mysterious bookmobile with rock music blaring loudly from its speakers and an enigmatic driver who knows more about you than you know yourself? What if that bookmobile only came around at night, and only every few years when you least expect it? The narrator of this intriguing graphic novel, Alexandra, becomes obsessed with tracking down the bookmobile. She longs for it in a way she can't understand. She loses her boyfriend to this obsession. She changes careers (becoming a librarian, of course). And she continues to read at every opportunity. The bookmobile's collection responds accordingly, so that by the time she reaches middle age, the shelves are cramped full. Alexandra's dramatic decision at the end is unsettling, but not surprising. She is now in a position to help other book lovers recapture those golden moments from their own reading memories. The book was published in 2010, after being serialized in the London newspaper, The Guardian. It's one of several "visual books" Niffenegger has produced. She is most famous for the novels "The Time Traveler's Life" and "Her Fearful Symmetry," but clearly art is a passion. Among the courses she teaches at Columbia College in Chicago is a writing course that explores "text-image relationships." "The Night Bookmobile" takes only ten minutes to read, but it manages to pack a punch. Niffenegger made me think about how books have influenced me throughout my life. Like looking at old photos or finding a long-lost item, paging through books I've already read enables me to re-discover what I loved about them. Reading them again also provides insight into the person I was when I first read them, as though I were stealing a glimpse of myself through a window. Our library director urged everyone to read this book, so I read it during a slow time at the library. Although it's technically a graphic novel, the way the story is laid out is more like a picture book, with large chunks of expository text that are not integrated into the artwork. At first this was kind of a turn-off to me, and I didn't think the layout with it looked that great a lot of the time. But the story, about a woman who gets obsessed with finding a mysterious night bookmobile that co Our library director urged everyone to read this book, so I read it during a slow time at the library. Although it's technically a graphic novel, the way the story is laid out is more like a picture book, with large chunks of expository text that are not integrated into the artwork. At first this was kind of a turn-off to me, and I didn't think the layout with it looked that great a lot of the time. But the story, about a woman who gets obsessed with finding a mysterious night bookmobile that contains every book she's ever read, is compelling to anyone for whom books have defined their life. She sacrifices her relationship and other things to this obsession, begging the bookmobile librarian to hire her. He refuses every time. The premise reminded me, very vaguely, of something that Charles de Lint might have written. There's a definite charm to the idea - a roving bookmobile that shows up only when you're not expecting it and contains everything you've ever read - right down to the backs of cereal boxes! What avid reader wouldn't want to browse around a collection like that? I know I smile when I encounter an old favorite in a place I don't expect it to be. But the premise was about all I truly enjoyed. The drawings w The premise reminded me, very vaguely, of something that Charles de Lint might have written. There's a definite charm to the idea - a roving bookmobile that shows up only when you're not expecting it and contains everything you've ever read - right down to the backs of cereal boxes! What avid reader wouldn't want to browse around a collection like that? I know I smile when I encounter an old favorite in a place I don't expect it to be. But the premise was about all I truly enjoyed. The drawings were just okay; they looked like they were done by an advanced amateur - which, since they were done by the author, I guess is correct. I think the subject would have been better suited by something a lot glossier and darker, with flashes of bright light when the bookmobile shows up - something more like the Polar Express, perhaps. As far as the protagonist, who in their right mind would want to spend eternity in a library that ONLY contained what they've already read? I love re-reading old favorites, but to never again read something new? That would take all of the joy out of it. What I got out of the book is that you should read for yourself - for the sheer pleasure and joy of the books themselves - and not read to please or impress others. This was such a chance find at a little library in Dublin. I rarely read graphic novels. Not for lack of interest, but because books in this genre are so hard to come by, and so expensive in India! I had read Niffenegger’s ‘The Time Traveler’s Wife’ many years ago when I read nothing but contemporary fiction. I hadn’t known that she had penned a graphic novel. Exquisite in color, ‘The Night Bookmobile’ is an ode to the booklover in all of us. Quaint and esoteric, this invites you into a rich wor This was such a chance find at a little library in Dublin. I rarely read graphic novels. Not for lack of interest, but because books in this genre are so hard to come by, and so expensive in India! I had read Niffenegger’s ‘The Time Traveler’s Wife’ many years ago when I read nothing but contemporary fiction. I hadn’t known that she had penned a graphic novel. Exquisite in color, ‘The Night Bookmobile’ is an ode to the booklover in all of us. Quaint and esoteric, this invites you into a rich world of color - the sort of color that reading imprints on our minds. We are the words we write. We are also the words we read. We are everything. We are nothing. 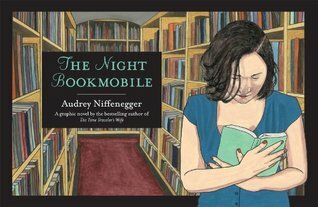 The Night Bookmobile is the third graphic novel by the best-selling author of The Time-Traveller’s Wife, Audrey Niffenegger. It is a short story which has been beautifully illustrated by Niffenegger and tells the story of Alexandra who, wandering the streets of Chicago after an argument with her boyfriend late one night, comes across the night bookmobile. When she accepts the librarian’s invitation to browse, she finds that, to her amazement, it contains every book she has ever read. When the bo The Night Bookmobile is the third graphic novel by the best-selling author of The Time-Traveller’s Wife, Audrey Niffenegger. It is a short story which has been beautifully illustrated by Niffenegger and tells the story of Alexandra who, wandering the streets of Chicago after an argument with her boyfriend late one night, comes across the night bookmobile. When she accepts the librarian’s invitation to browse, she finds that, to her amazement, it contains every book she has ever read. When the bookmobile leaves at dawn, finding it again becomes an obsession for Alexandra. This is a haunting tale brought to life by Niffenegger’s evocative full-colour pen-and-ink work. Enchanting and beautiful. From the after words: When I began writing The Night Bookmobile, it was a story about a woman's secret life as a reader. As I worked it also became a story about the claims that books place on their readers, the imbalance between our inner and outer lives, a cautionary tale of the seduction of the written word. This graphic novel is a short story about a woman stumbling across a bookmobile, and how that encounter changes her life in unexpected ways. It starts out as one thing, then there is a twi From the after words: When I began writing The Night Bookmobile, it was a story about a woman's secret life as a reader. As I worked it also became a story about the claims that books place on their readers, the imbalance between our inner and outer lives, a cautionary tale of the seduction of the written word. This review has been hidden because it contains spoilers. To view it, click here. I was really looking forward to reading this. I loved Niffenegger's earlier works (Time Traveler's Wife is one of only 3 books I've ever read more than once), so when I heard the concept for this graphic novel, I was ecstatic. But I have to admit I was flummoxed by the ending, and although I had been enjoying it up to that point, the strange turn of events at the end just ruined the entire experience for me. This book has been described in various forums as a cautionary tale about what happens wh I was really looking forward to reading this. I loved Niffenegger's earlier works (Time Traveler's Wife is one of only 3 books I've ever read more than once), so when I heard the concept for this graphic novel, I was ecstatic. But I have to admit I was flummoxed by the ending, and although I had been enjoying it up to that point, the strange turn of events at the end just ruined the entire experience for me. This book has been described in various forums as a cautionary tale about what happens when reading becomes an obsession that eclipses all else. I've known for a while that I have a bit of that obsession within me. My to-read list grows exponentially by the day. I'm a librarian who set a personal goal of reading one book a week in 2010. I am never without a book close at hand, in case I can steal a few minutes here and there to read a couple of pages. So, I could really relate to the main character in the story. I thought she dealt with her love of reading in a very sensible way, and I would NOT categorize it as an obsession at all. She went to library school and advanced through the ranks to become a library director. Voila! She has reached the pinnacle of her career surrounded by the books and library she loves! Next page, she commits suicide so she can be with her books for all eternity. Whaaatttt? I didn't classify her lifetime of reading as an "obsession" at all. Am I blind to it? Perhaps. My husband read it too and said the obsession was pretty clear. (Subtle hint? Perhaps.) Nonetheless, her suicide made absolutely no sense to me and I wish Niffenegger had just ended the book a few pages earlier. The idea of a bookmobile containing all the titles you've personally read in your lifetime is such a beautiful concept, and I hated to see it all ruined by senseless tragedy in the end. But judge for youself. This review has been hidden because it contains spoilers. To view it, click here. This, I feel, is a fundamentally sad work. While a beautiful story that appeals to most of my gut interests; libraries, books, a hidden fantastic side to reality, it reaches conclusions that I find questionable at best. I am not sure exactly what the message is here. However, the way Niffenegger explores this battle between the idealized world of literature and the inner mind and the disappointments of everyday life, is still very compelling to me. In particular, I enjoyed the grounding of the w This, I feel, is a fundamentally sad work. While a beautiful story that appeals to most of my gut interests; libraries, books, a hidden fantastic side to reality, it reaches conclusions that I find questionable at best. I am not sure exactly what the message is here. However, the way Niffenegger explores this battle between the idealized world of literature and the inner mind and the disappointments of everyday life, is still very compelling to me. In particular, I enjoyed the grounding of the work in the city of Chicago, which grants the story a dose of realism to its whimsical melancholy (I admit I Google Street viewed the intersection of Ravenswood and Belle Plaine after reading to see what it was like). The graphic novel follows the story of Alexandra, a lonely Chicagoan who pines away after coming across the mysterious Night Bookmobile and its intriguing librarian, Mr. Openshaw, which contains a complete catalog of everything Alexandra has ever read. For someone like Alexandra (or I), this would be a treasure trove of self-reflection, illustrating much of what made you who you are. Returning to the bookmobile periodically over the years, the desire to recapture her reading past causes the introspective and obsessed Lexy to focus her energies on becoming a librarian, a director of a prominent library in fact, in the “real” world. However, even this does not sate her obsession and she sacrifices much, too much, to follow it. As someone who, in the past, has also considered the possibility of a literal “heaven as a type of library,” this is a seductive idea, but what good are the reflections and thoughtfulness of books without everyday life to counterbalance them? In any case, the story is definitely thought provoking. I was loving it, then it got morbid (which really isn't all that surprising for Audrey Niffenegger). But I still really liked it. I miss the good old days of reading picture books and after recently throwing away the old censor that told me I am too old to read them, I decided that I was going to enjoy a book for being a book and forget about these thoughts or challenges that ask me to read one over 100 pages or it doesn’t count as reading a book. When I popped into the library yesterday with my partner I came upon a treasure of a picture book. Now called graphic novels or stories that are written for adults, The Night Book Mobile is a serial that ran in the newspapers transformed into a book that can be enjoyed in its entirety and enjoy it I did. The story itself has dark undertones that make the book definitely for an adult audience, but the concept is one that can be loved and understood by anyone who loves books. I am an addict and proud so when reading about Alexandra and her journey through reading and through finding the Night Bookmobile I had that sort of excited and almost thrilling high as I devoured the story and its beautiful pictures in less than half an hour. I mean, who wouldn’t love to escape to a place where all the books you have ever read in your life are all in one place? Who wouldn’t love to sit there, sipping tea and travel down memory lane, from the picture books to the intense thrillers to even your own journals written as a child through to adulthood? Count me in. But there was a catch, and that catch had me feeling anguish for Alexander and I was seriously in a panic; which to me is what makes the ending of this book and her reality even more sensational to read. The artwork was simplistic, not overdone but still enjoyable. Not the greatest, but I still loved looking at it and I would certainly recommend this book to all avid book readers as it would be the perfect gift and the perfect addition to any Night Bookmobile of anyone’s imagination. However with an ending like that, even though I did enjoy it I have to say it might have cost it a star. I'm in the middle of listening to Her Fearful Symmetry, and am loving it, and also just found The Night Bookmobile on the graphic novel shelf at the library. There's so much here in this little book... which, like one reviewer said, is more of a graphic short story than a graphic novel. But... like all amazing short stories... it is packed full, rich, deep, and somehow enormous. Of course it appeals to me as a book lover--that whole idea of a library containing every book you've ever read, your I'm in the middle of listening to Her Fearful Symmetry, and am loving it, and also just found The Night Bookmobile on the graphic novel shelf at the library. There's so much here in this little book... which, like one reviewer said, is more of a graphic short story than a graphic novel. But... like all amazing short stories... it is packed full, rich, deep, and somehow enormous. Of course it appeals to me as a book lover--that whole idea of a library containing every book you've ever read, your entire life history as a reader. And I love the way Niffenegger treats the idea of reading itself--as something essential, joyful, but also something that can maybe, at times, keep us closed off, away from real life. Alexandra, the heroine, adores books, and she is a lovable, sympathetic character, but there is a deep sadness about her and her reading life as well as a joy, and her story is somewhat creepy as well as magical. It's this odd, alive mixture of feelings and emotions that I'm loving about Her Fearful Symmetry, and that makes me want to read more of Niffenegger's work. WOW. Imaginative and moving and wonderful and creepy. I always imagined that our individual bibliographies were unique identifiers, like our fingerprints. Audrey Niffenegger depicts them as personal bookmobiles. I hope mine looks like the Partridge Family bus, and that orange drink is served instead of tea. One of the most emotional moments in short narrative is when Alexandra contemplates all that she "had given up for reading." This line reminds avid readers that there are important differences WOW. Imaginative and moving and wonderful and creepy. I always imagined that our individual bibliographies were unique identifiers, like our fingerprints. Audrey Niffenegger depicts them as personal bookmobiles. I hope mine looks like the Partridge Family bus, and that orange drink is served instead of tea. One of the most emotional moments in short narrative is when Alexandra contemplates all that she "had given up for reading." This line reminds avid readers that there are important differences not just in the material that we read, but in our motives for spending so much of our time involved in books. Niffenegger's protagonist reads for escape. I read to inform and enhance the moment in which I'm living. I guess that's why we're on radically different journeys to that vast Central Reading Room in the sky. If I have any regrets about the time I've spent living with books, it's that I've squandered so much prime reading time in short-lived efforts to organize my reading materials and list my reads and reviews. (Ahem...I still luv ya, Goodreads!) On the other hand, it cracks me up to find old books with stamps and marks proving that I graciously allowed my brother to "check out" books and records from the collection in my bedroom. They are all due for return the same day they were borrowed. Meh. I picked this up on a whim from the library and read it in my car while I was waiting for a storm to pass. I had quickly glanced at some goodreads reviews prior to reading this, so I was expecting a lot more. I liked the idea behind this book -- I'd love to have a library of every single thing I've ever read -- but it completely lost me three-fourths of the way through. I didn't care for the ending at all, nor was I sure what to make of it. ...... what the hell did I just read? Okay, so the basic premise is that every person in the world (presumably) has a Bookmobile that is filled with everything they have ever read. The main character in this book finds her Bookmobile one night and becomes obsessed with it. But she doesn't find it again for many years. I'm not quite sure what I was meant to come away from this thinking. It seemed to suggest that getting too involved with reading is bad? That we shouldn't forget to live our real lives by becoming obsessed with fictiona Okay, so the basic premise is that every person in the world (presumably) has a Bookmobile that is filled with everything they have ever read. The main character in this book finds her Bookmobile one night and becomes obsessed with it. But she doesn't find it again for many years. I'm not quite sure what I was meant to come away from this thinking. It seemed to suggest that getting too involved with reading is bad? That we shouldn't forget to live our real lives by becoming obsessed with fictional worlds. I think. But there was also an element of romanticism to the whole thing. So that was confusing. But maybe it was just that our main character's personality was "flawed". Because was it reading that she actually loved and was obsessed with? If this is the case, why did she so desperately want to be a librarian of a library that was filled only with books she had already read? Schade, ich hatte mir mehr erhofft. Die Geschichte ist sehr ziellos und im Prinzip ziemlich bedrückend (aber nicht auf eine bewusste Art) und enttäuschend. A haunting, quick tale - part urban legend, part fun. Be warned though - this is not for kids. It's for adults - and even if you are adult, it may leave you a little shaken. This book was a MAJOR disappointment for me. I honestly can't believe an author would write such a book - Where a person can be so obsessed with books that she kills herself. To back up, I LOVE Niffenegger's The Time Traveler's Wife - It is one of my all-time favorite books and I highly recommend it. I also enjoyed, but not nearly as much her other novel, The Fearful Symmetry. HOWEVER, I can't believe she wrote The Night Bookmobile AND the book had so much promise at the beginning. It is the first half of the book that I even gave it 2 stars, It had such good promise. I was LOVING the premise of the story - A mysterious bookmobile that only shows up sporadically and when you least expect it from dusk to dawn. This book houses all the materials that the patron has very read, including personal diaries. It was mysterious, fun and she wanted to work at the bookmobile. It was so inspiration and really felt like my own story - she ends up going to library school and being a real librarian, but still seeks the mysterious night bookmobile. THEN the story crashes - she becomes so obsessed she kills herself (she does end a relationship early in book because of obsession, but I was able to forgive that) - THEN, AND only THEN is she able to be the librarian for the Night Bookmobile - see only the decreased can run the bookmobile and they are assigned there own patrons. On top of all this, the graphics are horrible and poorly drawn. The second time she sees the night bookmobile the story states it's in a McDonald's parking lot in Chicago (the fact that it took place in Chicago was kind of cool); however the picture showed it in front of Wrigley Stadium and NO McDee's any where to be found. Niffenegger's debut novel, The Time Traveler's Wife (2003), was a national bestseller. The Time Traveler's Wife is an unconventional love story that centers on a man with a strange genetic disorder that causes him to unpre Audrey Niffenegger (born June 13, 1963 in South Haven, Michigan) is a writer and artist. She is also a professor in the MFA Creative Writing Program at Columbia College Chicago.